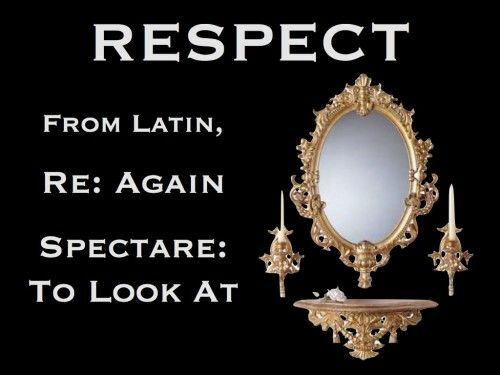 It comes down to a lack of respect for others, and for themselves ultimately, where they lack the ability to look at themselves in the mirror and see what they are doing so. They lack self-respect, to look at themselves honestly. For some reason, they don’t care about their intentionally malicious and hurtful actions towards others. They validate, justify, excuse and rationalize that what they are doing is “right”. This abusive or malicious behavior is all about them and issues they have in their lives that they are taking it out on others for some reason, and it makes them feel good. There is a saying: “misery loves company ”. They are miserable, and they want to make other’s miserable. They feel like a victim, so they want to make other people into victims by abusing them. They can target one person, a few people, or many people to try to be purposefully hurtful towards. Sadly, some people have underlying issues in themselves, in their lives, in their psyche, and want to project their aggression and feelings of inadequacy out onto other people. They also seem to enjoy doing. It makes them “feel-good”. They are so confused internally, that abusing, bullying, harassing, trolling or being malicious to other people is “fun” for them. They enjoy spending their time and energy to purposefully make things up and try to take people down to their miserable level. Instead of spending time, energy and effort looking at themselves in the mirror, they take their time, energy and effort to purposely try to put people down, make fun of them, insult them, call them names, and they enjoy it. It feeds their negative ego-“I”-self construct. They don’t want to deal with their own internal issues and be a more positive ego-“I”-self. They often don’t even see and recognize these deep issues within themselves. They also often don’t want to see, they don’t want to look. They are in denial about themselves. They lack the ability to look at themselves honestly, they lack self-respect. Then you can start to respect others after you deal with your own internal mess. Find that issue that has you engaging in these actions, find the root causal factor. It usually comes back to a lack of self-care and self-“love”. If you deny there is even such a thing as a range of emotions characterized by words like care or “love”, then you are stuck in denial and will never heal. Learn to have more respect and responsibility for yourself and your actions. This requires care, courage and will-power to honestly face the mirror. Psychopath etymologically means suffering of the psyche, mind or consciousness, from psyche (mind) + pathos (suffering). Most of us are suffering from the condition of this world (within varying comparative degrees). We all have some level of issue in psyche, consciousness, don’t we? But some people are more visibly “psychopathic”, more visibly in a state of deep suffering, than others, because we can see it by their actions. We are often engaging in wrong actions, creating suffering for others, because we suffer ourselves. It’s a catch 22 in many ways. The only way to escape the cycle is to learn and become aware of how this is functioning around us and within us. But this is no excuse, justification or rationalization to continue with our current condition and perpetuate more suffering. People who don’t suffer don’t create suffering for others to suffer by their actions. 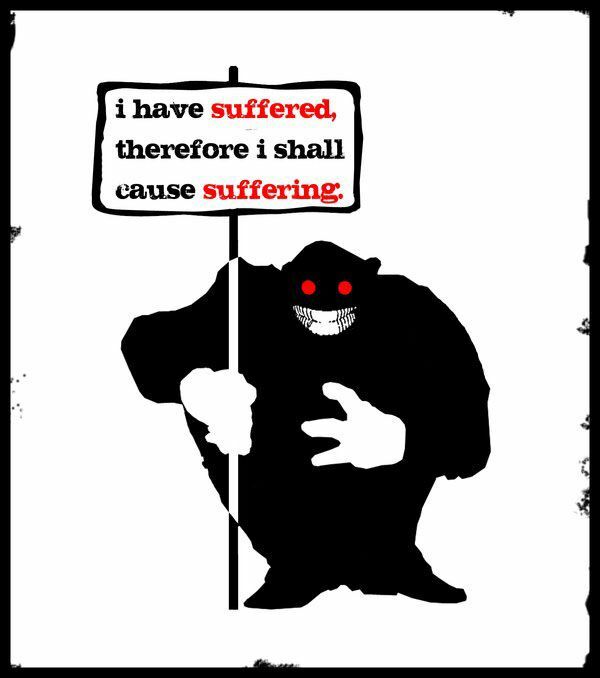 Only suffering people create suffering for others. 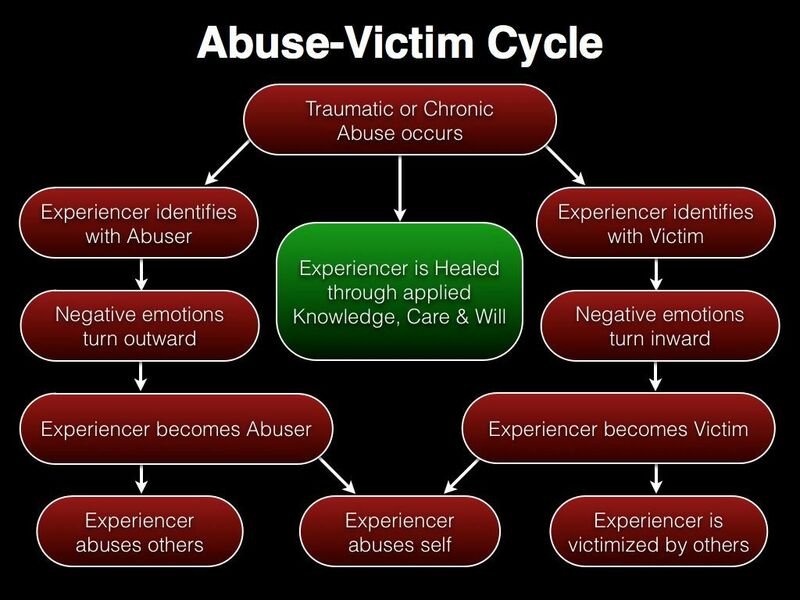 The above infographic illustrates how we suffer ourselves and then we continue to create suffering for others, as an abuse-victim perpetuation cycle. The lack of self-knowledge is from a lack of self-respect to look at ourselves in the mirror, a lack of self-“love” to care to do that work on ourselves, and a lack of self-responsibility to own up to the actions and behaviors we create in reality. This lack of self-knowledge, self-respect, self-love and self-responsibility creates the self-inflicted suffering and self-imposed enslavement we live in and continue to perpetuate, for ourselves, and others. You can try to reason and argue with some of these people that are suffering, but denial is strong and they won’ t hear any of it. On the internet it can be a large waste of time. Some people are called trolls for this. Trolls feed on attention. If you keep engaging with them it feeds their need for attention that they desire from you. It means what they are doing to try to irritate you is working out for them, because you give them what they want. Feeding them keeps them coming back for more food, attention. This is the sad internal state they are in. Their psyche and consciousness is suffering, and they seek attention in malicious ways to keep themselves entertained. The best way to deal with trolls, is to not feed them. Don’t feed the trolls. Starve them from the attention they crave.